Here's one of my very favorite postcards, and it's not even a cartoon! 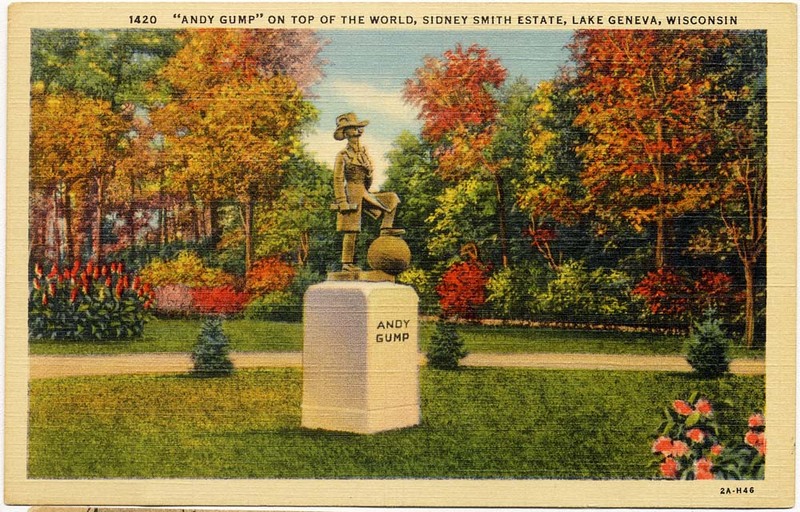 This card shows a statue of Andy Gump that was presented to Sidney Smith by the Chicago Tribune. He installed the statue on his estate in Lake Geneva, Wisconsin, and there it became a postcard subject, as seen above. Nice gardens, Sidney! When Smith tragically died in 1935, the statue was moved to the lakefront Flatiron Park of Lake Geneva, and a plaque was added commemorating the town's famous former resident. The plaque boldly trumpets The Gumps as "the first daily comic strip" in the headline, then backs off a bit in the body text, saying it was the first daily comic strip in the Chicago Tribune. Of course neither claim is correct, but whatever. Don't believe everything ya read, kids! Tragically, the statue was destroyed in 1967 in what is described as "a drunken riot." Three cheers for the town fathers, who were so attached to the statue by then that they commissioned a reproduction of the original, and put it back on display. There seems to be disagreement around the interwebs regarding whether the statue was destroyed and recreated yet again in 1989, and one source claims that it is no longer on display in the park, but has been moved to the Lake Geneva Museum. Frankly that seems like a good idea, since the mean streets of Lake Geneva seem to be crawling with hoodlums and nogoodniks. Here are some good photos of the statue as of 2014. This beautiful linen postcard was produced by the Curt Teich company. Based on the card code, 2A-H46, we know that it was issued in 1932. On the reverse it says "C.T. Art-Colortone", and credits the photographer, E.A. Bishop of Racine Wisconsin.